The Three Lions are one of the most followed international football teams in the world, but international success has been hard to come by for them with their only major trophy being the 1966 World Cup. Their best finish in the European Championships has been third which they achieved in 1968 and 1996. To pick a greatest England XI from only the Euros is a challenging task and it comes as no surprise that some of the players from the 1968 and 1996 squad make it to this team. England’s supposed ‘golden generation’ of stars suffered heartbreak against Portugal in 2004 in the quarter-finals, but some of the players in that squad also make this team. 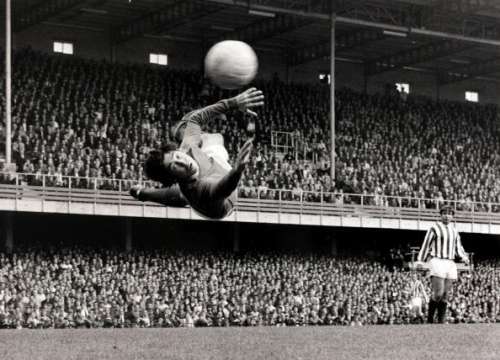 One of England’s and the game’s greatest ever goalkeepers, Gordon Banks was a true English legend. An integral part of the World Cup winning squad in 1996, Gordon Banks was named by the IFFHS as the second best goalkeeper of the 20th century after Lev Yashin. The former Leicester City and Stoke City goalkeeper was known for his athletic saves and commanding presence in the box. He was also adept at pulling off miraculous saves from point-blank range. Banks was so good that he was named FIFA Goalkeeper of the year six times in his long and prestigious career. Gordon Banks had an amazing career for England. He played 73 times for England, kept 35 clean sheets and lost only 9 times. He truly deserves his place as the undisputed number 1 in this squad.